Lock in a great price for DPNY Beach Hotel & SPA – rated 8.9 by recent guests! Excellent cuisine! Excellent drinks! Fantastic ambiance and amenities. The best choice here in Ilhabela. All accommodations are so comfortable, the breakfast was amazing (champagne, great foods and fruits). The room service was impeccable, all staff are friendly and stay all the time at our service. The pool area and restaurants are amazing, and I’ve no bad words at all. The hotel experience was great. The only issue we had was related to the room in the annex building, as we were expecting to stay in the same facility of the hotel. However, I suggest Booking to specify in a caps lock letter that it's in a different one. Apart from that, the room itself, service and food were a lovely experience. The staff were incredible. The beach, pool, restaurant, and room marvelous. Please try the cocktails and food at the beach. They also have bottom less mimosas at breakfast. Definitely one of the best places I have ever been. Bed was amazing, Jacuzzi was amazing. Hotel is beautiful! The place is so beautiful and staff are really nice Breakfast is the better I've ever had. Very friendly and helpful stuff, stunning beaches, very comfortable rooms. It's the second time on DPNY and the hotel structure continues spectacular. Have a beach with everything you need like amazing beds, chairs, towels, food and just a few steps from your room is simply awesome. The breakfast is very good too. Serviço de praia excelente, muito confortável e limpo. DPNY Beach Hotel & SPA This rating is a reflection of how the property compares to the industry standard when it comes to price, facilities and services available. It's based on a self-evaluation by the property. Use this rating to help choose your stay! 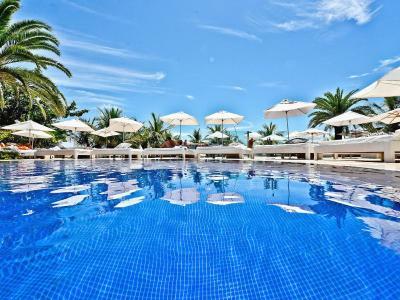 DPNY Beach Hotel & Spa is located on the island of Ilhabela across from Praia do Curral Beach. It features splendid indoor and outdoor swimming pools, a private garden, saunas and a luxury spa. Wi-Fi is free. 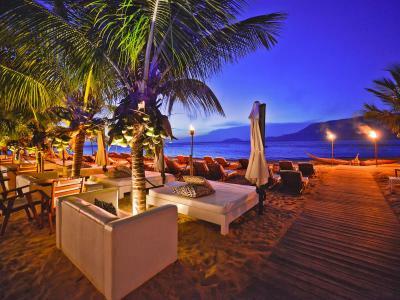 Guests can enjoy the private beach front on a large beach lounge or inside a shaded beach hut. Hotel DPNY offers sophisticated rooms with a balcony, air conditioning and an LCD TV. They are elegantly styled with contemporary décor and feature a king sized bed with a canopy. Some rooms offer ocean views. Every morning a buffet breakfast can be enjoyed, while the sushi bar and beach restaurant make for ideal lunch options. Guests can indulge at the Tróia Restaurant, which offers mouth-watering contemporary Mediterranean dishes. The spacious sun deck with lounges is an ideal place to listen to music played by live DJs. 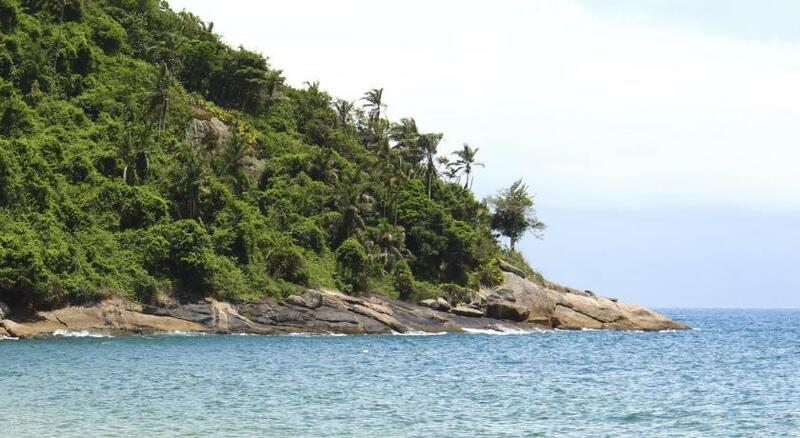 Travelers can also visit the Ilhabela center, 6.2 mi away, which offers shops and additional restaurants. When would you like to stay at DPNY Beach Hotel & SPA? This air-conditioned room comes with a Nespresso coffee machine, mini-bar and safe. It includes a 32-inch LCD TV with cable channels, turn-down service upon request and free internet wireless access. Please note, this room is located in a separate hotel building across the street. House Rules DPNY Beach Hotel & SPA takes special requests – add in the next step! DPNY Beach Hotel &amp; SPA accepts these cards and reserves the right to temporarily hold an amount prior to arrival. DPNY Beach Hotel & SPA accepts these cards and reserves the right to temporarily hold an amount prior to arrival. Please note that 5 Stars Suite Annex Building is located in a separate hotel building across the street. The hotel does not accommodate group reservations. The bed was too soft for my taste and the air conditioner was placed in a spot in the room that made it difficult to cool the room down. Wi-fi did not work correctly. It was an expansive weekend. So many good things comes for a price, and what a price. The first room we were put in overlooked the road and we could hear every car, bus or motorbike that passed, also everyone waking past talking. I asked if it would be possible to move to another room but they would only move me if I paid £120 more. This was an offer after we waited half an hour in the original room for them to call with an answer and another hour in the bar waiting for them to come and tell us news. Eventually I went to reception and got a very frosty reaction, we were moved but to a room with no balcony or window, other than a small window in the bathroom. The staff seem to be miserable here, only a very few smiled and were helpful, the others everything seemed to be a chore for. There were also very few English speaking staff and it was almost impossible to ask for anything from the bar or restaurant without a translator, attitude was also very bad here. Room in the annex building - however, good option for those who are looking for a very silent option. Service is poor. Lacks management. Daniel is the only waiter who provides good service. The others are not helpful at all and don’t accomodate any of your requests. Poolside and restaurant service was slow and got our orders wrong. In my room: Toillet and sink has little flow, tend to clog. Staff, location, silence, room & bed.